We showed up on time. Oh dark-30. Parked our car on a pull-off area on a mountain road in Kebler Pass, located in the Crested Butte area. The twins stepped out of their vehicle next to us – dressed in camo, do-rags and running shoes. The reflective tape on their shoes gleamed in the pre-dawn and I thought, “I’m in trouble here.” My hunting boots already felt heavy. Not only had we arranged to hunt the high country of Crested Butte, Colo., with our friends and acting grouse guides Katherine and Eric Grand, but also, Olympic biathletes Lanny and Tracy Barnes joined us for this morning’s dusky grouse hunt. 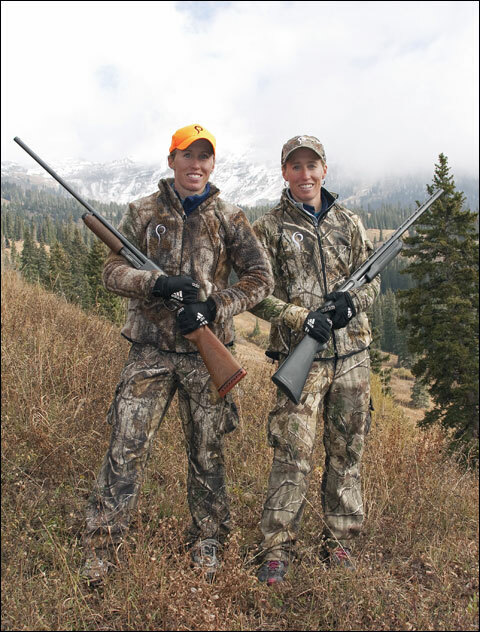 The Barnes’ sisters took a weekend break from their Olympic training routine in Utah, to scoot back to their home state of Colorado and hunt October’s season of dusky grouse with us. 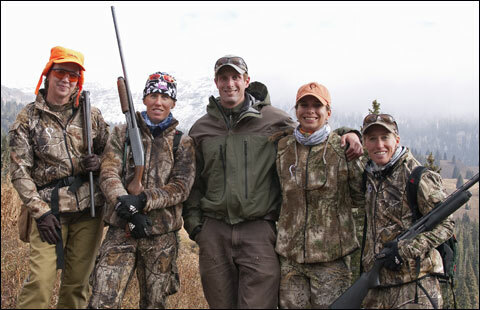 In fact, these young women grew up hunting with their father and still hunt whenever possible, eking out time between training sessions, or including two-hour runs before hunting. They are hunting machines – in running shoes. 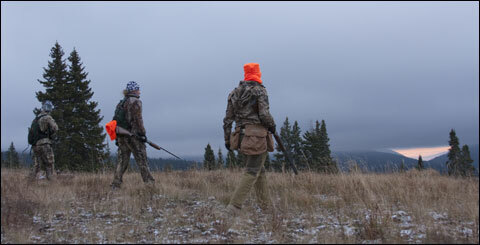 The twins believe their diet of organic wild game, acquired through hunting, is an important tool – part of their training regimen. The author (far right) with Olympic twins Lanny (middle) and Tracy Barnes head out at first light in the Crested Butte area of Colorado. 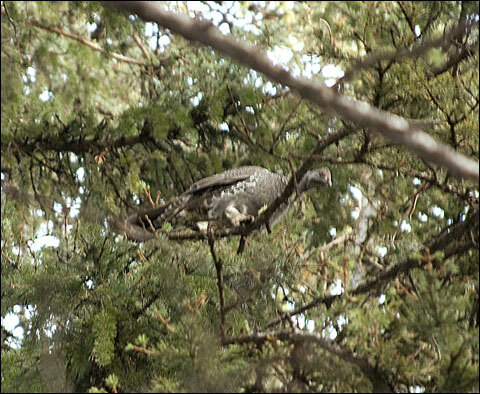 The dusky, aka blue, grouse is the only animal known to fly to higher elevations in the winter. This bird’s hunting season usually runs from Sept. 1 through Nov. 20, and West of I-25 only, with a daily bag limit of three and a possession limit of nine. And hike we did. Up, up and up to more than 11,000 feet. The twins, in their foot attire, scampered like mountain goats and used a skiing-type method (minus poles and skis, of course) to traverse down mountainsides. We snuck up on mountain meadows and grassy areas. Nothing. We crept into forests, always looking up. Nothing. We smelled elk everywhere, and came upon a wallow that looked like feral hogs had been at work. But, the credit went to a local herd of elk that had just been there. The ground was still warm. From this alititude, we admired vistas that would make fine doublewide postcards at the local tourism shop. But we only saw one, count ’em, one grouse. In fact, our guide and photographer found him. He sat alone in a pine about 25 feet high. We hunters had already passed through that neck of the woods and stood out in a grassy meadow. Meanwhile, the photographer and the guide tried to cajole, scare and move that grouse out of the tree so it would fly over us. And fly he did – about 60 feet from the nearest shooter. A lone grouse roosted in a pine that eventually eluded the hunters. Katherine also said, “A good dog increases your chances too. Just make sure he is well trained because a dog that ranges out too far will ruin you opportunities.” Of course, for that hunt, we had no dogs. But, we had the twins; they covered ground like panthers. From left: The author, Lanny Barnes, Eric Grand, Katherine Grand and Tracy Barnes. Tracy said, “The birds in Colorado, because of high altitude, tend to be a little slower.” Slow, fast, after five hours of climbing and seeking, it became clearer and clearer – while getting foggier and foggier because a cloud had descended on us – that we would be grouse-less. Lanny (left) and Tracy Barnes are on the pro-staff at Próis Hunting and Field Apparel for women and wore the company’s camo on the hunt. So we did what all hunters do after a long, exhausting hunt. We found a local diner and chowed down on pita concoctions with sprouts. Located in Paradise, it felt heavenly to rest and visit and talk about the one that got away. About a week later, Lanny and Tracy sent photos of a recent grouse hunt in their neck of the Colorado woods, near Durango. A few of the birds harvested on the day’s hunt. 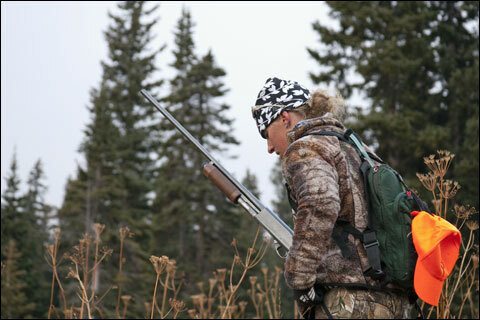 The women hunt with shotguns that hold special meaning. Lanny’s godfather, Austin Stockton, gave her a Remington Wingmaster 870 in 20 gauge. 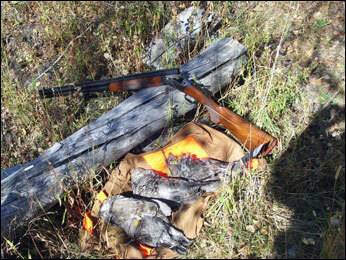 She shot her first waterfowl and grouse with this gun, and wouldn’t trade it for any more modern, synthetic shotgun. Tracy’s gun is a Remington Model 17, 20 gauge, given to her by her father, Thad. The Model 17 originally belonged to Thad’s father, Norman Barnes, who had acquired the gun when he was a sophomore in high school, about 1930, in Michigan. He hunted ducks with it, and then passed it on to his son. Tracy said, “That shotgun has helped feed the Barnes family for over 80 years.” And, at the rate these women are going, it’ll probably feed the family for another 80. In the mean time, you can keep up with the twins’ adventures at their website. Also, you may donate to their fundraising for the 2014 Olympics. For more information about Colorado Small Game hunting, visit the state’s online guide. Barbara Baird is publisher of Women’s Outdoor News, an e-zine that features news, reviews and stories about women in the outdoors. 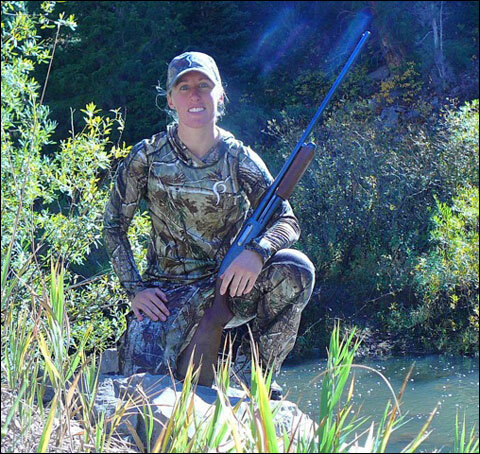 An NRA pistol instructor, avid huntress and freelance writer in travel and outdoor markets, Baird can be found afield or on a range when not editing or writing.